Imagine sitting around this lampshade and reading a good book :). 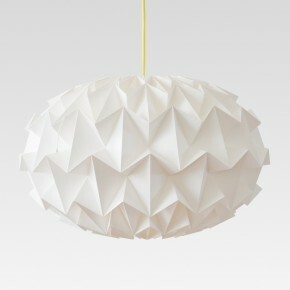 This lampshade is folded with utmost precision out of 3 pieces of Shade paper. The strong folds play with the light, resulting in charming cast shadows. The lamp gives smooth, cozy light. It is very suitable for everyday use. It is suitable for use as the only source of light in the room. The lampshade fits around a standard energy-saving lightbulb. The lightbulb and the cat are not included. -48 cm / 18.9 inch diameter. 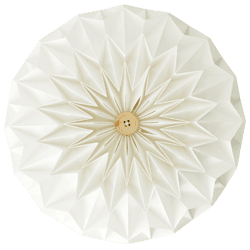 The bottom of the lampshade is a wooden button.